I know, I'm asking for it. But Dallas Independent School District spokesman Jon Dahlander just sent over a few photos of George and Laura Bush making "a surprise visit this morning to their neighborhood school, Dallas ISD's John J. Pershing Elementary," where he hung out for more than an hour as he meeted-and-greeted with the kiddos and teachers. 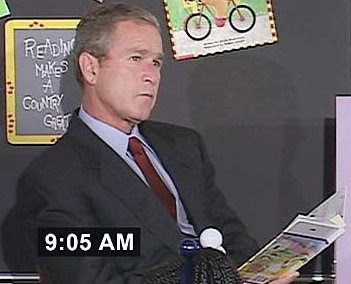 Says Pershing principal Margarita Hernandez, "President Bush made several students pledge and commit themselves to read more instead of watching TV. He told students that reading is the key to everything, including to being president." So here's one of the pics. But only because, look, I swear I've seen this picture before.